hoping to do something a bit different… i decided to make a pleasant elegant meal for valentines day — that we might eat in the dining room, instead of the couch! after a bit of thinking about what might brighten an otherwise dreary february — i settled on duck breast with candied orange peels and a roasted mushroom risotto (and a de(re? )constructed caesar salad on the side…). this is a pretty simple meal… with a few simple underlying techniques. i knew that people who kept cats were strange. there’s nothing you can’t do with some copper tubing and wire cutters. i thought this would be a million $$$ idea, and was getting ready to call starbucks … until this. 12 yrs too late. damn you google. one of my alltime favorite topics around penn state is whether or not we should be eating horses. its a shocker for all of our equine.minor students, but also a bridge to talking about other ideas. certainly, when i was in france — horse meat was not so strange; but, then again snacking on man’s best friend leads to cogent and necessary discussions about the ethics of eating meat. enter the plight of the bluefin tuna; and the ever-so-burdensome effort to replace it with, gasp, yellowfin tuna. who knew horses would be in such demand?! me? i’ll stick with the smoked duck. a recent post in lifehacker about ‘barbeque sauce‘ reminded me that i hadn’t posted by ‘white’ or oil&vinegar bbq sauce. it also reminded me that most people don’t acknowledge the difference between grilling and bbq. for grilling (sometimes called “smoke roasting”… the temperature of the coals (or gas grill!) is usually between 350-500F for burgers, steaks and chops. larger cuts of meat, bone-in poultry and sausages usually range between 240-350F. true bbq-ing occurs between 160-240F. this oil&vinegar bbq sauce is meant for chicken (usually done in a charcoal pit — see the picture) and is only slightly modified from my days as a grad student (assigned to help bbq chicken at the Virginia State Fair back in 1978). mix in a bucket; apply liberally after the chicken begins to brown (preferably using a toilet brush — there is considerable debate surrounding the issue of this item). i find that this recipe works well on a gas grill if you cut the vegetable oil back to 1/3 gallon — which avoids a lot of flareups). notably, towards the end of the cooking process, usually during the last 2-3 turns of the chicken — add a small bottle of texas pete (or your favorite hot sauce) to the bucket. it adds a nice flavor; but, be warned, if you add it too early in the cooking process; the hot sauce will burn off — leaving a bitter aftertaste… ). i know; i butchered the title… but, who needs all those potential ‘hits‘?? i just re-read the last HP book and want to throw in my $0.02 regarding the ending of the soontobereleasedsuperspecialseventhandfinal(noreallyitisover)volume from ms.rowling. most folks think that harry, himself, is the final horcrux — or, piece of voldemort’s soul. that seems most likely to me as well. but, rather than being killed or sacrificing himself to destroy voldy; harry will lose his powers and become a REAL boy. that would be much nicer than killing the poor bloke, AND make sure that he doesn’t have any further adventures. yesterday, we had a very pleasant surprise!! 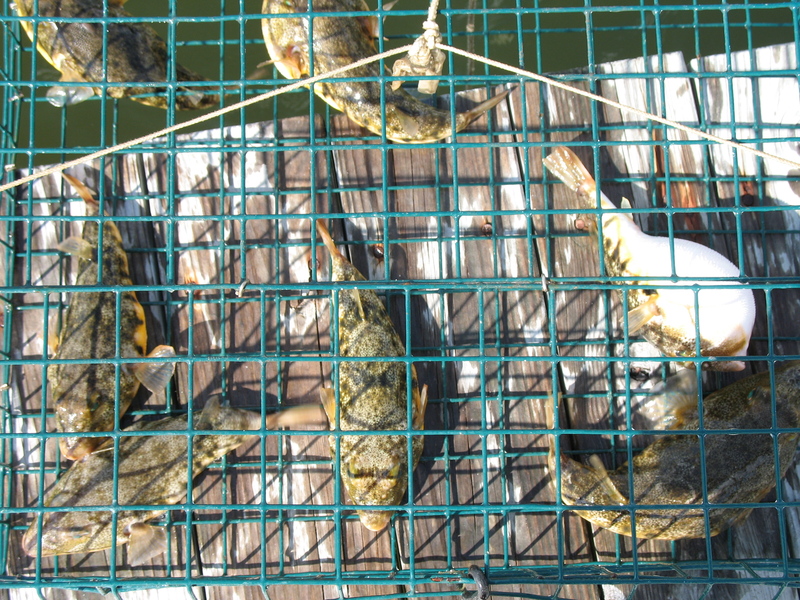 a neighbor pulled up a crab trap filled with blowfish. as a kid, a local fisherman — Mr. Grey, taught us how to clean the blowfish (and also tried to get us to make blowfish-head soup). needless to say, we used to catch them all the time — but, over the last 10 years, rarely, if ever. i suppose it’s officially barbeque (barbecue?) season!! which always leads to the never-ending controversies of “what kind of bbq sauce is best?”!! red or white, is the usual question — though i completely disregard the entire ‘mustard’ issue… i will NOT use mustard in my bbq. if you like it .. check out south.carolina! Recently, ‘A’ found a recipe in Gourmet Magazine for shrimp and mango salad with glass noodles. It’s listed as serving 4 and a 20 minute prep time. Honestly, this was enough for the two of us (with 2 shrimp and a few noodles left over). oh yeah…. use about 1 tsp toasted sesame oil… or, if you’re like me; liberally sprinkle the following hot red oil!!! heat the oil til just smoking (about 375F) and remove from heat. Add all peppers. the longer you leave the peppers in the oil (i usually go overnight), the hotter the oil gets. strain the oil through a fine sieve or cheesecloth. pour into a ‘shaker’ bottle (i use old worcestershire sauce bottles… cleaned, of course) — then add the sesame oil.